The main addition in this release is a file browser interface, which gives Pyonic the ability to load and execute files in the interpreter. This is mildly useful on its own, and I’ve had comments that people would like to be able to do it, but it’s also groundwork for full support for file editing support. I hope to add these features in a future version. I’ve just released Pyonic interpreter 1.2. As usual, you can get it from Google Play, now for Python 2.7 or Python 3.6. The APKs can also de bownloaded directly from Github (where the source code is also available). 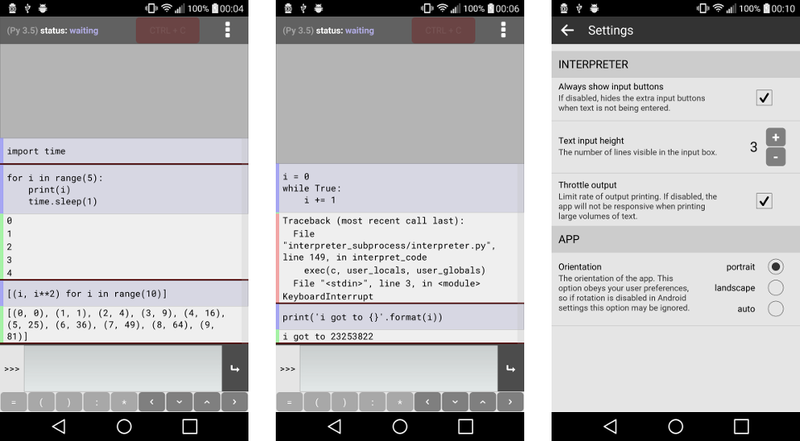 This is the first release to target Python 3.6 on Android (not just Python 3.5), which is made possible by recent additions to python-for-android. I expect to do a separate python-for-android release to announce this shortly. 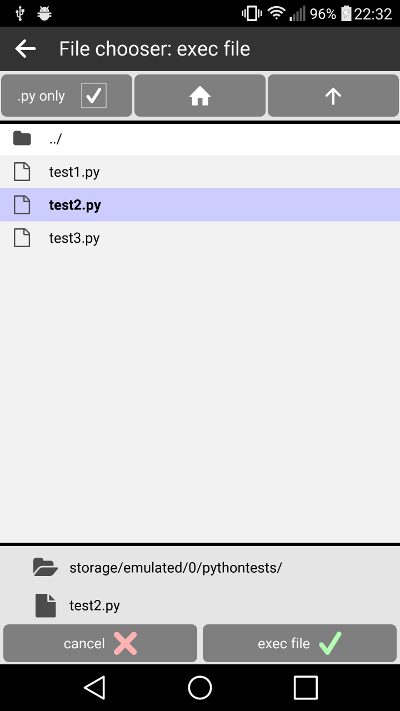 The main change to the app this release is support for the input and (in Python 2) raw_input functions. These would previously crash as the interpreter isn’t really being run in a shell, so the way they try to take input doesn’t work. 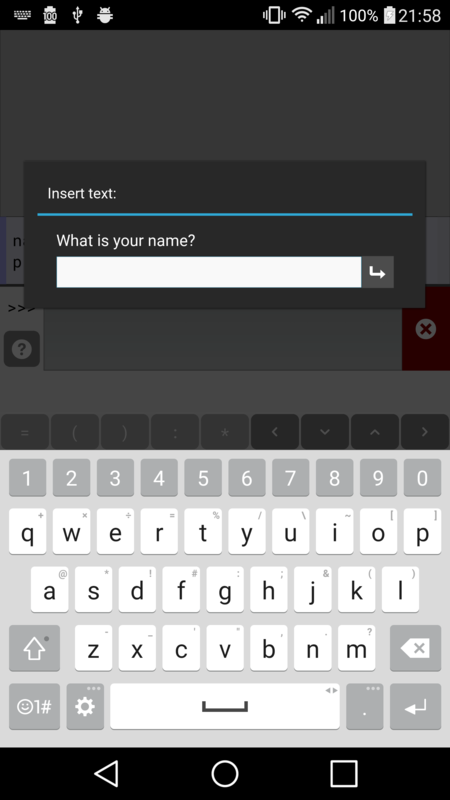 They are now overridden with new replacements, which should hopefully behave roughly the same way as the originals are supposed to, but via a more convenient popup gui for the text to be entered. I’m still working on file editing and other Python management functions, but there didn’t seem to be any reason to delay a release since according to the Google Play reviews people are trying and failing to use the input functions. The major feature in this release is autocompletion support via the excellent jedi library, as is used by many editors and IDEs. 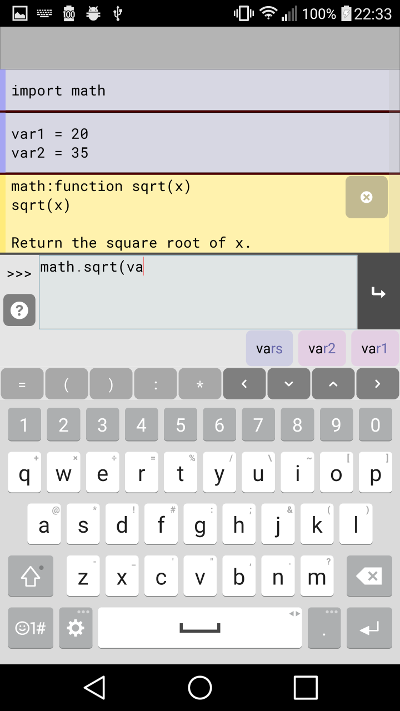 Pyonic now automatically gives a list of autocompletion options as you write Python code, any of which can be selected by tapping it. There’s also a new help button, which when pressed shows the call signature and docstring of the Python object reference currently under the cursor. As a further bonus, I’ve reduced the size of the Python 3 APK by a further ~25%, it’s now around 11MB. This is probably still a little larger than it needs to be, but is much better than the massive 19MB version that I first published! 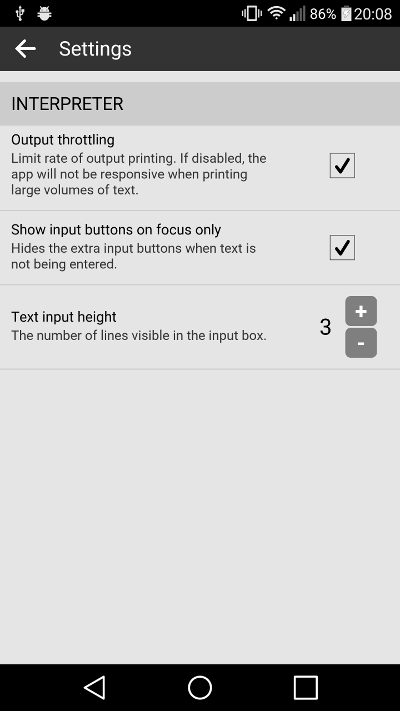 I’ll continue to try to improve this with tweaks in python-for-android’s Python 3 build process. For the next release, I intend to go back to improving Pyonic’s process handling, and from there to add support for pip installation of new modules and file editing. The latter of these will also benefit from the new autocompletion integration. 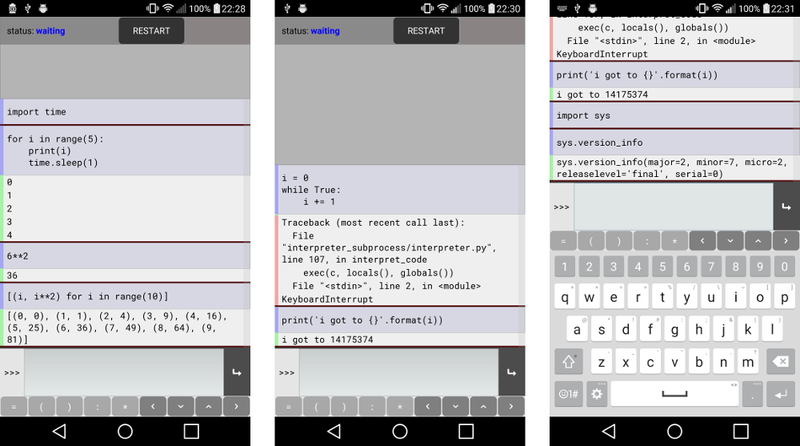 The app is written in Python using Kivy, and uses exactly the same code under both Python versions. This code is open source and available online on Github. This release includes most of the short term improvements I had planned, since supporting Python 3 didn’t raise any major issues. I expect that development will now focus on adding a few more usability tweaks, then working with the Python packaging to add features like pip installs for new modules, code editing (rather than just the interpreter interface), and support for GUI creation via Kivy.